Jennifer performed for my 21st birthday celebration on Saturday, November 18, and her performance was absolutely spectacular! From beginning to end she wowed my guests and I, and months later, I still have friends and family praise her and ask me how I found such an amazing belly dancer. Besides her performance, Jennifer is kind, patient, and friendly. She responded quickly to all my emails and texts and she even coordinated her outfit to the color theme of my party. I can wholeheartedly say that Jennifer is truly a world class performer and an amazing person. I promise you will not regret having her perform at your event. Thank you again Jennifer! Need Unique Orlando Birthday Party Entertainment? 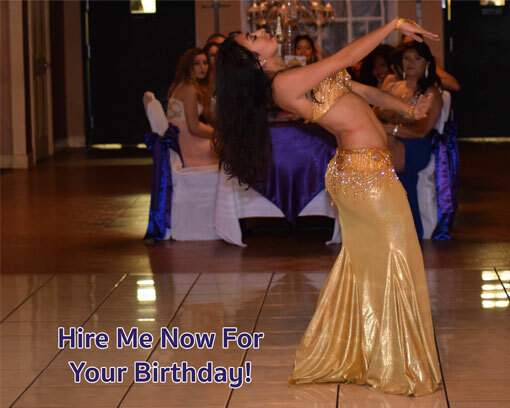 If you want to throw a birthday party in Orlando, FL featuring a high-caliber entertainer that will truly wow the crowd, a belly dancer is a fun and unique birthday party idea. Hire a bellydance champion (winner of the Belly Dancer of the World competition) to entertain at your birthday party! Imagine the rave reviews your guests will leave after watching the spectacle. Having a family-friendly belly dancer entertain for a 21st, 30th, 40th or even 100th birthday party is a fantastic surprise and really gets the festivities going! Having a Sweet 16 or Quince? Go to my Sweet Sixteen/Quince page. Planning a Kids Birthday Party? Visit my Princess Party page. If this is a surprise birthday party no worries, I can arrive at the event dressed as a normal guest (tell everyone I am a co-worker) and from there you can usher me over to a designated room where I can change and store my belongings. Planning the ultimate surprise is encouraged! Base Pricing – Travel fee is not included for out of Orlando events. This is ideal in scenarios where you want to surprise everyone with a full belly dance show (20 minutes) and have Jennifer help transition the guests from the food time to party time! Amazing balancing acts, hilarious birthday dance with the person of honor, and a total of 5 heart-pumping acts. With this package, you get the “Attention Grabber Package” with the addition of 2-3 specialty acts for a total show that is 30 minutes in length. BONUS: 15 minutes of picture time with the bellydancer after the show is included. Interactive and fun! Like fire? In this show, Jennifer will enter with a fire prop to “wow” the crowd. This will be followed by a belly dance show to ensure the most glamorous, over the top experience for your party! The total show length is 20 minutes (5 acts). Venue fire approval will be needed ahead of time. If you have a different idea for the specific structure of the show let me know! I am happy to accommodate your wishes so long as they create a strong performance. Simply call me today to discuss your vision and show needs.